The society was founded in 1831. Like most of the nation’s older historical societies, it has always been a private organization and derives virtually all its support from membership and endowment. The Virginia Historical Society elected Chief Justice John Marshall as its first president and former president James Madison its first honorary member. During the early years, between 1831 and 1861, the society acquired valuable books, manuscripts, museum objects, and natural history specimens. From time to time, it published the texts of historic documents and the addresses delivered at its annual meetings. This was hampered, however, by having virtually no endowment and no permanent home. During the Civil War, the historical society's collections were moved from place to place, with the result that many valuable items disappeared. The society invested its entire endowment—$5,000—in Confederate bonds, so it, too, was lost. In 1870, the Virginia Historical Society was reorganized and attempted to reassemble its scattered collections. It found temporary headquarters in the Westmoreland Club building, and embarked on a highly ambitious publications program. Eleven volumes were published in as many years, but the venture, having little financial support, brought the historical society to virtual bankruptcy. Under new leadership, in 1893 the society, for the first time, occupied its own building, 707 East Franklin Street. Today this location is known as the Lee House because it had served as the wartime home of Gen. Robert E. Lee’s family. Just one month after its move, the society published the first issue of the quarterly journal, Virginia Magazine of History and Biography. Under the direction of William Glover Stanard, the book and manuscript collections grew dramatically, and, as a reflection of his own personal interests, began increasingly to focus on genealogy. The growth of the collections and concerns about security led the historical society's executive committee in 1933 to approve construction of a fireproof annex to the back of the Lee House to accommodate the society’s library and museum collections. The Virginia Historical Society acquired Battle Abbey in 1946 from the struggling Confederate Memorial Association. The cornerstone of Battle Abbey (as the building came to be known) was laid in 1912, but the opening of the building was delayed by the First World War and Charles Hoffbauer’s determination to repaint the murals in the Mural Gallery that he had virtually completed before the war. The building finally opened its doors in 1921. In 1948, two years after the Virginia Historical Society acquired Battle Abbey, its president, Alexander Wilbourne Weddell, and his wife, Virginia (Chase) Steedman Weddell, were killed in a train accident. By terms of their wills, the society received the bulk of their estates together with Virginia House, their Tudor residence in Windsor Farms. With the Weddells’ generous bequests added to its endowment, the historical society for the first time in more than a century of existence, had adequate funds to carry out its scholarly mission. John Melville Jennings became director in 1953 and immediately began introducing up-to-date cataloging techniques to the library, developing its collections, and recruiting professional staff. In 1958-59 a large addition to the back of Battle Abbey accommodated the society’s offices, library, and reading room. The historical society left the Lee House and moved into its new quarters in the spring of 1959. During the decades 1960–80, the Virginia Historical Society’s collections grew to a remarkable degree, the publications program became more active, and increased numbers of researchers consulted the Society's resources. Devoting itself almost entirely to the academic community, the society eventually became a beacon of international scholarship in American and southern history. In June 1992, after raising $12 million and expanding the headquarters building, the historical society reopened as the Center for Virginia History. It embraced a broader vision with additional museum galleries, a strengthened endowment, increased public programs, a paper conservation lab, and an education department. Because of the statewide nature of its comprehensive collection, the Virginia Historical Society has the unique ability to exhibit and interpret broad themes in Virginia history. A long-term exhibition entitled The Story of Virginia, An American Experience opened in October 1995 and was well received in spite of limited gallery space. The feeling that a larger exhibition was needed coincided with recognition that the Virginia Department of Historic Resources (VDHR), a state agency, also had a vast collection of archaeological artifacts, as well as other resources, previously unavailable to the public. A unique private-public partnership resulted between the historical society and VDHR. As part of a $30 million fund raising campaign, the Society added a 38,000-square-foot wing in 1998. Two floors were leased by the VDHR, providing state-of-the-art storage for their collections and easy access by curators, scholars, and the public. The VDHR’s staff moved into the facility while maintaining their current governing and operating independence. This joining of the VDHR’s archaeological and historic preservation functions with our research library, museum, and educational functions on one “campus” is the first private-public partnership of its kind in the country. The main floor of the 1998 wing houses the Story of Virginia exhibition. It includes many of VDHR’s archaeological holdings, expanding the story to include Virginia’s 16,000 years of prehistory. The strength of the VDHR collection—ordinary and everyday artifacts—complements ours, which emphasizes the exceptional and extraordinary. Together, these artifacts provide visitors with a comprehensive history of the commonwealth. In 2004 the board announced the 175th Anniversary Campaign: Home for History. The most visible component of this $55 million effort was another new wing completed in early 2006. 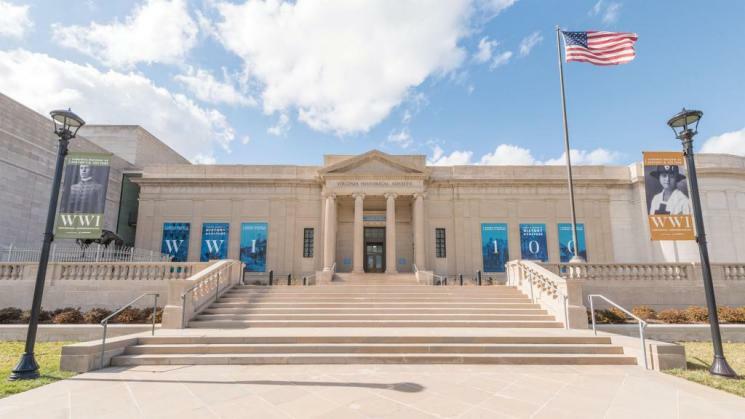 This $16 million addition of 54,000 square feet includes a 500-seat auditorium, new exhibition space, a state-of-the-art classroom, and enough space to house the next twenty years’ worth of anticipated growth in collections. These new facilities allowed the museum to expand its programs to its membership and the general public through adult learning classes, symposia, and teacher institutes. At the same time, a series of exhibitions celebrated important anniversaries in Virginia's long history and presented the story of the state in a wider context. These exhibitions included Jamestown, Québec, Sante Fe: Three North American Beginnings, Lee and Grant, and American Turning Point: The Civil War in Virginia (cosponsored by the Virginia Sesquicentennial of the American Civil War Commission). Digital initiatives, such as Unknown No Longer: A Database of Virginia Slave Names and HistoryConnects (a distance learning program), and the Created Equal Film Series in honor of Grady W. Powell, a film and discussion series that focuses on themes related to civil rights, human rights, and social justice in American history, reached new and diverse audiences. In 2015, the society successfully completed the Story of Virginia Campaign. This $38 million campaign resulted in the dramatic renovation of the society's internal spaces. The creation of the Carole and Marcus Weinstein Learning Center on the ground floor offered state-of-the-art classrooms for visiting school groups and adult learning classes and a dedicated studio for the HistoryConnects initiative. The Helga Koch Gottwald Gateway to History presented visitors with an expanded and enhanced entrance to the museum. On the first floor, new museum space offered greater opportunities to mount traveling and changing exhibitions and to present a re-imagined Story of Virginia exhibition. In 2018, after nearly a year of research, community conversations, and strategic planning, the Virginia Historical Society announced a new vision and a new name for its headquarters facility—The Virginia Museum of History & Culture. This historic change marks a new era of expanded public programming, new exhibitions, and greater activity across the Commonwealth, as the historical society works to tell a more inclusive story to a more inclusive audience.